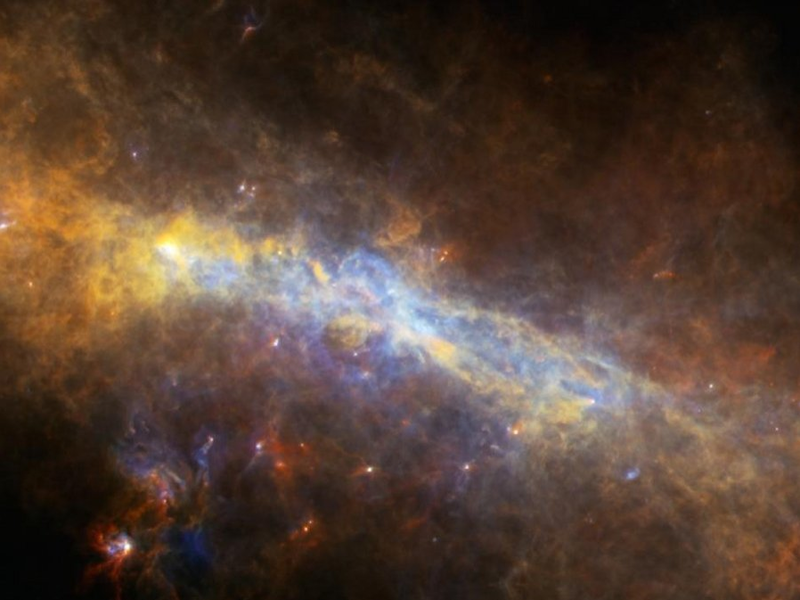 The center of our galaxy is enshrouded in interstellar dust — a mixture closer to smoke than dust bunnies here on Earth. This veil makes it difficult to study the interior the Milky Way using visible light. Dust lurks in other galaxies too. In distant galaxies in the young Universe, dust is ubiquitous. How were these vast reservoirs of dust created so quickly? The authors of today’s paper use observations of dust near the center of the Milky Way to argue that supernovae may have been responsible for our Universe’s dusty dawn. When a star goes supernova, it ejects material rich in heavy elements, like carbon and oxygen. These heavy elements are the building blocks for interstellar dust. The problem is, after the supernova explodes, the expanding supernova remnant collides with surrounding gas and sends a reverse shockwave back through the expanding shell. This shockwave can destroy much of the newly formed dust as hot gas rips apart the dust grains atom by atom, in a process called sputtering. In order to show that dust can survive this interaction in the early Universe, the authors targeted a region of our Milky Way that is likely the closest analogue to the earliest galaxies: the galactic center. The authors observed the remnant of a supernova (called the Sgr A East supernova remnant) that exploded 10,000 years ago, just 5 parsecs from our galaxy’s supermassive black hole. In the galactic center, the density of the ambient gas is higher than the galactic average, similar to the dense environment in the earliest galaxies. The age of this remnant also ensures that any dust remaining must have survived the reverse shockwave triggered when the remnant collided with this dense surrounding gas. Warm dust emits blackbody radiation most strongly in the infrared. Using the SOFIA observatory – a modified Boeing 747! – the authors detected infrared emission coming from dust in the supernova remnant. 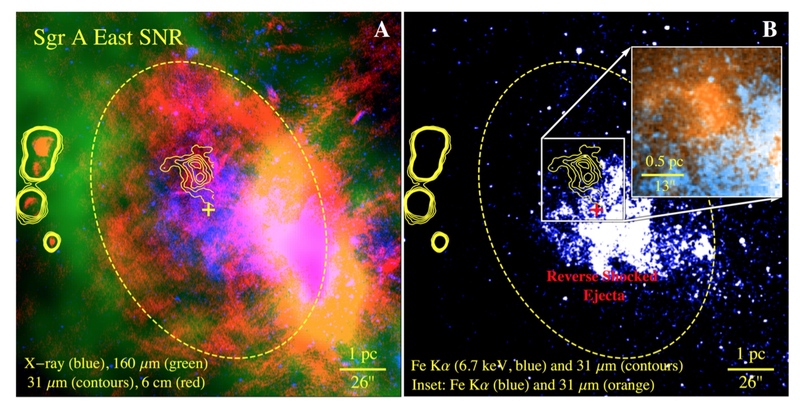 To be sure that this dust is actually inside the supernova remnant, the authors compiled observations at other wavelengths (Figure 1). The authors used radio, X-ray, and submillimeter observations to show that the dust emission is located near the center of the remnant and is not associated with any nearby cold gas clouds. Figure 1: Multi-wavelength view of the region around the supernova remnant. The dust emission is indicated in yellow contours. The X-ray emitting hot gas (purple) does not overlap the dust emission, indicating that the surviving dust is in a cooler, denser part of the remnant. The submillimeter emission (green) indicates that the dust emission is not coming from a nearby cold molecular cloud. All of the observations seem to point to the same conclusion: dust has survived in this supernova remnant. The authors go on to investigate the temperature and structure of the dust. By comparing the intensity of the infrared emission in different wavelength ranges, the authors made a map of the color of the region (Figure 2), translating color to dust temperature using Planck’s Law. The dust in this region is being heated by radiation from the central star cluster around the black hole. But the dust in the supernova remnant has a strangely high temperature; it’s at 100 Kelvin compared to 75 Kelvin dust at the same distance from the star cluster. The authors posit that this high temperature could be due to three factors. 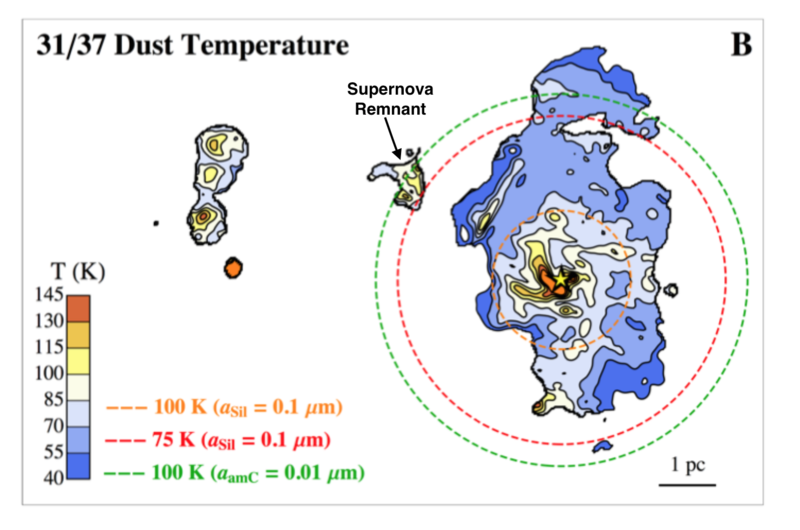 Figure 2: Observed dust temperature in and around the supernova remnant. The supernova remnant is the blob at 100 K located above center. The circles indicate the expected dust temperatures assuming that the central star cluster (yellow star) is heating the dust. The large dust grains (orange and red circles) are not heated as easily as the small dust grains (green circle). The remnant dust emission agrees most closely with the small dust grain model (green circle). First, there could be other nearby stars providing additional heating. But these would be expected to show up as point sources in the infrared images, which are not seen. Second, collisions of dust with electrons could heat the dust, but the authors determine that the density and temperature of the electrons in the area are not sufficient for collisional heating to be important. Third, the authors propose that the dust is composed of smaller dust grains than usually assumed. Just as chopping up an onion allows it to be cooked more quickly, breaking grains of dust into smaller pieces allows them to be heated more easily. The authors posit that the reverse shockwave in the supernova remnant fragmented the dust grains which survived at all, reducing the average dust grain size by a factor of 10. The authors also show that modeling such a mixture of dust grain sizes can reproduce the observed infrared fluxes at a range of wavelengths. Adding up the infrared emission observed in this remnant, a total of 0.02 solar masses of dust has survived 10,000 years after the supernova. Depending on how dust production is modeled, between 7% and 20% of the dust produced in the supernova survived the shockwave in this remnant. This survival rate could be boosted even further in denser environments, as we expect for the earliest galaxies. The authors conclude that supernovae could have contributed much of the dust observed in the early Universe. From my understanding, usually at the core of galaxies lie long-lived stars, M-dwarfs. Many of those stars are still alive from their inception and would not lead to the supernovae that produce this gas correct? That leads me to believe that at the time these M dwarves were formed, so were massive stars that eventually went nova. That must mean there are a huge amount of SN remnants in the bulge! Think if we can find retention rates one can formulate an estimate as to how many of these stellar remnants in there exist? I had never heard of sputtering before – how cool! Great to see the SOFIA telescope being put to use. I’m sure that even more accurate observations will be possible in the infrared with the James Webb telescope. Why would a higher percentage of gas potentially survive sputtering in a denser environment? Thanks for this great post! I love the fun fact you included about the SOFIA observatory — I had no idea that it was a modified 747! What are other potential sources of dust besides supernova explosions? It would be interesting to see a parallel study examining other sources. This is so cool!!! Incredible that we can still see the remnants of a supernova from 10,000 years ago! I would have expected these remnants to have spread a lot further in 10,000 years, so much that we wouldn’t be able to observe them in a clump- why did this not happen? Following from that, are there reasons to believe that these remnants are the mixture of the remnants of many different events? Very nice post!